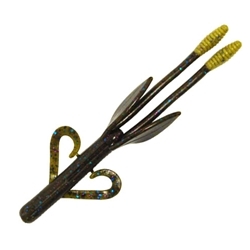 The Big Bite Flying Squirrel is a hybrid of a finesse and creature bait. It has characteristics that allow it to be used for finesse or power techniques. It features two "bulb" tail sections that are made from floating plastic. The Flying Squirrel has legs that are very thin and when combined witht he floating plastic "bulb" on the tail causes them to wiggle with the slightest rod movement. It is great on a shaky head, but can also be used as a Texas rig, Carolina rig, or jig trailer.